You have worked hard to show that your name means something. 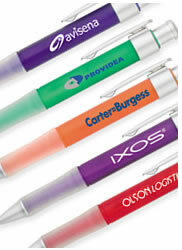 From imprinted personalized pens to that special, unique business gift, let RGI take your name and identity to the next level. Radio Gate offers over one thousand different promotional items, both classy and traditional, and contemporary and unique. Our goal is to get your name in front of the right people. Our competitve prices and low minimum order quantities allow you to shop through a number of promotions marketing ideas. Everything from custom imprinted mugs, mousepads, and magnets, to giant trade show displays and much, much more. Contact us today to learn about the products we offer. A stronger corporate brand image will boost your stock price by an average of 5-7 percent.